Rock legends Black Merda release new LP ‘Forward from the Past’ | Sonic Smash-Music! The titans of American rock known as Black Merda have released a new offering for fans new and old, “Forward from the Past.” The milestone LP includes 12 original Black Merda tracks for a listening time approaching a full hour. It has been proudly published on the Third Child Productions Inc. independent record label. It is the eighth offering from the group since their self-titled debut on Chess Records in 1970. Featuring razor-sharp instrumentation, socially conscientious songwriting, and that classic Detroit funk-rock sound the band helped innovate nearly fifty years ago, “Forward from the Past” stands as proof that Black Merda can slay with the best of them in the 21st century. The Motor City funk-rock crew have influenced far more musicians than can feasibly have influenced Black Merda, themselves, however, and this influence may seem stronger today than ever before. Fans of the group will note that “Forward from the Past” maintains a steady course from 2009’s “Force of Nature” while incorporating more contemporary digital music methods at the same time. The result is a rock record with soul, groove, rhythm, and plenty to say to audiophiles of every age and creed. Black Merda began in the mid-1960s and reunited in 2005. Today they are original members Charles Hawkins, Anthony Hawkins, and VC L. Veasey. They survive drummer Tyrone Hite who passed away in 2004. They have shared the stage with the likes of Edwin Starr (“War”), Gene Chandler (the Duke of Earl), Wilson Pickett, the Spinners, the Artistics, Billy Butler, the Chi-Lites, Joe Tex, Jackie Wilson, the Temptations, Eric Burdon (the Animals) and War. Their story is a legitimate part of music history. More recently, Black Merda were sampled by Ja Rule in 2005 and by Kanye West in 2009. The Detroit Metro Times named the Merda’s 1970 track, “Cynthy-Ruth” as one of the 100 Greatest Detroit Songs Ever. The track was also featured in the HBO documentary, “The Nine Lives Of Marion Barry” (2009). Spinner.com featured Black Merda in their 2010 article, “In Living Color: 20 Important Black Rockers Past and Present.” Their 2009 reunion LP’s chief single, “Take A Little Time,” was re-released on Mojo Magazine’s 2010 compilation, “Heavy Soul.” The Detroit Metro Times also revisited Black Merda in 2010 by choosing their self-titled 1970 debut album as one of “Detroit’s Greatest Hits that Should Have Been” (10 November 2010, Music Issue). 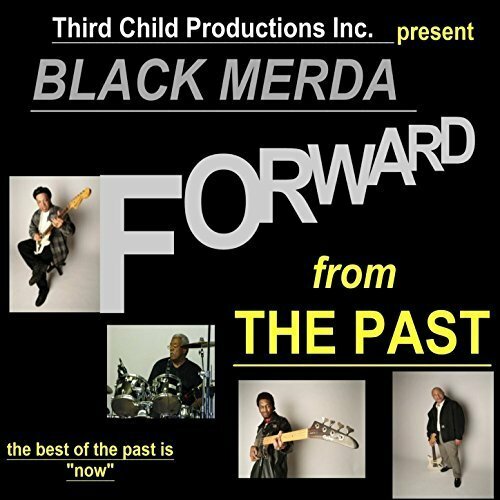 “Forward from the Past” by Black Merda from Third Child Productions is available online worldwide from over 600 quality digital music stores now. Get in early, funk fans and fans of the Detroit rock sound everywhere. This entry was tagged 60s and 70s, best black rock bands, BLACK MERDA, classic detroit rock, forward from the past, new album, sixties and seventies.